Wred Fright's Blog: Masked Professor Sighting! "Iz it da great Finn leader hisself?" -- Joyce. I can confirm wit'out even being baptised that sure does look like that it be the mortar board guerilla clown down St, Augustine way at the Loose Screws bookstore and emporium,134B King Street catty-corner up from Flagler College. 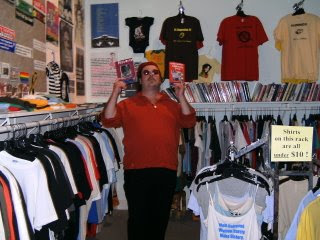 Where all the best in underground literary supplies are carried especially TPFEs by Wred Fright and many other fine looking and well wrought reading books from The ULA/LitVision Press like SSECURITY by James Nowlan (alsp pictured) and Jack Saunders' "Bukowski Never Did This" tome. To name a few. So when you get down NorthEast Florida Way check 'em out and buy 'em up. And support this excellent independent bookstore at the same time!